7 February 2009. Little Wars Convention. Lincolnshire, IL USA. BIG Battalion Game. Click on photos to enlarge them. Check back more than once. We may add more to this posting in the next day or two. See Der Alte Fritz Journal link to the left and down for the most commentary and more photos -- first. View from the southeast corner of Lobosch Hill. Wally B. commanded Austrian forces on the hill. Here you see a Hungarian Battalion starting to move up the southern slope early in the game. The yellow papers are our Quick Reference Charts for BAR, Batailles de l'Ancien Régime 1740-1763. We rarely consult the main rule book. See links to the left for oldregimerules to learn more about BAR. After tough action the Lobosch was in Austrian hands at game end. That's the same Hungarian battalion seen earlier. 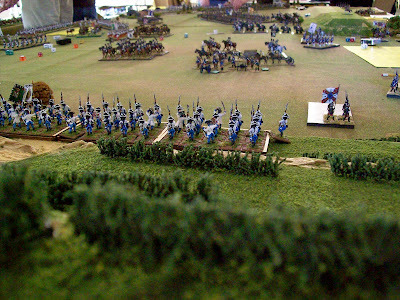 Note the sweeping panoramic view of the plain to the westward stretching to the Homolka Mound and beyond the mass of Prussian infantry to the Morellen-Bach Stream some thirteen feet away. The main table was 8'x16'. One compelling concept is the height of Lobosch Hill. The camera for this shot rested on top of the tallest point aiming downwards. The bottom of the camera was 7.5" above the table surface, the lens perhaps at 9" elevation. Larger terrain pieces than we are accustomed to, like Lobosch, give one a new and interesting perspective of the three dimensions. You really DO think units are ascending a real hill. You really can make units completely disappear behind them. In other cases shallower elevations enable one to place units in partial cover. That's a tempting idea. This latter option does not force us to come up with tricky measuring conventions about how much a 1/2" or 1" elevation hides something. Never mind that sort of thing. Just place miniatures in such cover and determine how much you can actually see by using your eyes. If the lower half of miniatures can't be seen, give them an appropriate cover advantage. This makes things easier, faster, fun and visually rewarding. Be sure to click on the photo above to make it larger. At game end we look eastwards from the Morellen-Bach Bridge. The Homolka Mound is in the upper left. 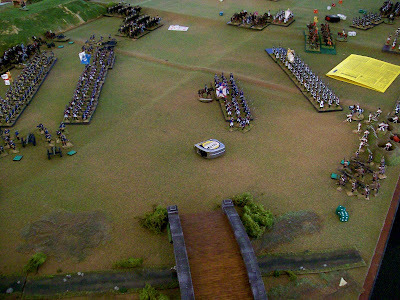 At game end the two sides face off along the Morellen-Bach. 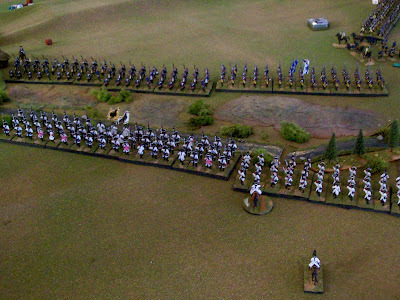 Chuck as a Prussian faced the combined Austrian team of Rich and Dave from DPC - you know - the gentlemen who sell RSMs. For more photos and commentary see the blog of Der Alte Fritz in links to the left. Prussians: Chuck L., Mike F., John B., Rick L.
Austrians: John M., Wally B., Rett K., Rich and Dave of DPC and James K.
Judges: Jim, Randy and Bill. We did not play in the game for a change. You can do the above too. To everyone that is checking out this blog. Everyone that played in the game told me they enjoyed it! 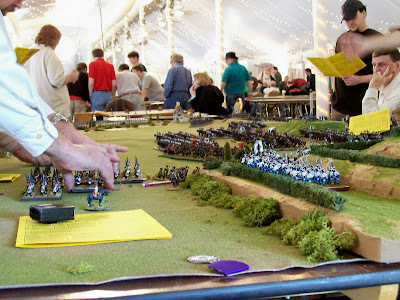 It is quite a spectacle to see that many figures on a table. Some people that I knew could not believe the amount of the figures that was on the table. and hopefully, this will relieve some of the pressure on Broglie near Frankfurter? Thank you, Bill. . . I've been waiting eagerly for some more photographs of the Lobositz game. It looks fantastic. Saxon Cavalry Brigade Exercises And?